The 2018 Recorder of the Year Award was presented to Sue Ryan, CMC, City of Newberg. The guidelines for Recorder of the Year state any OAMR member, City Manager, or Mayor may submit a confidential nomination to acknowledge recorders and recognize their excellence and professional accomplishments. 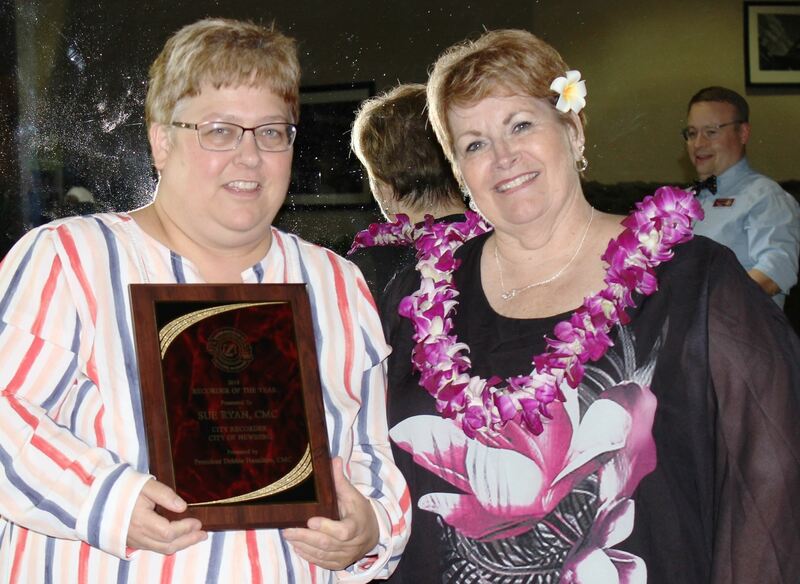 The nominee must have made an outstanding contribution or performed outstanding service to OAMR, to the profession of Municipal Recorder, or to an individual city during the association fiscal year. This award recognizes outstanding service and performance over and above the person’s job description. Some possible strength’s might include areas such as public relations, records management, legislative or council procedures, or even a special project. Mayor stated he’s worked with many City Clerks over the years but Sue stands among the best and has been an outstanding model of a professional City Clerk in her knowledge, work ethic and commitment to service. She was able to convince the Council to switch to electronic packets although we drug our heels prior to being convinced. She keeps us current in public meeting laws, trainings, conferences and in providing the tools and information needed for part-time employees. She’s consistent in the accuracy of research and providing invaluable advice on important issues such as elections and public records. She is the consummate professional with a spirit of empathy and service to our citizens. She excels in Records Management; is a member and active participant of the Records Management Committee. She steps up to take on new projects and always offers expertise. Emergency Preparedness – after their city had a significant flooding incident Sue jumped right in to the emergency preparedness mode with swift thinking, decision making and action to alleviate the problem, working long hours, hard work and dedication to saving the City’s records archives which would have been much worse had these actions not been performed. She also this bad situation to end up teaching others and strengthened her city’s position in using this as an opportunity to teach others. Sue has taken a personal responsibility for educating the public about the role of the City Clerk with a special historical display and background material prominently displayed at their City Library. This list goes on and on. Sue is obviously a very dedicated, driven, professional, public servant who is held in very high esteem not only by her City Manager, Mayor, and Council but also by three of her colleagues and peers. The list of accolades they all submitted was quite impressive. It was my honor to present Sue Ryan the prestigious award of Recorder of the Year for 2018. My sincere congratulations go out to you Sue! Please read the guidelines below and take the time to nominate any City Recorder or yourself to receive the Oregon Association of Municipal Recorders’ “Recorder of the Year” Award. You are encouraged to participate in this program, in order to acknowledge recorders and recognize their excellence and professional accomplishments. 1. Any individual OAMR member, board member, City Manager, or Mayor may submit a confidential nomination to the President. 2. The President shall select a recipient for the Recorder of the Year award from the nominations submitted. There may be years in which there are no outstanding nominees. The decision of the President is final. 3. Recognition will be at the annual conference and will include presentation of a plaque and complimentary registration at the following year’s annual OAMR conference. The registration is not transferable to anyone other than the award winner. a. Any OAMR member in good standing is eligible, with the exception of the President, First Vice President, and Second Vice President. A member in good standing means a fully paid member. b. The nominee must have made an outstanding contribution or performed outstanding service to OAMR, to the profession of Municipal Recorder, or to an individual city during the association fiscal year. In general, it is not sufficient that a person performed his/her duties well. This award recognizes outstanding service and performance over and above the person’s job description.